As our cruise ship approached Huatulco, I got a glimpse of the jagged coastline, and luxury condos and villas perched on top of steep cliffs. But as the ship dropped anchor, my attention focused at the lively beach (Playa Santa Cruz) a few yards away from the pier. It was a white sandy beach with emerald green and turquoise blue water, lined with colorful beach umbrellas, restaurants and other commercial stores, accented by a church (the Capilla de Santa Cruz). Given the close proximity to the pier, it was the center of tourist activities. We were approached by people offering crafts, souvenirs and boating excursion and tours. We walked around town, to check out the stores and restaurants, and got a good work-out walking from store to store. By mid- morning, the sun was getting intense, so we went back to keep cool along the beachside where the breeze was constant. Passing a beachside restaurant, I remembered what our ship resident tour guide recommended for us to try: fried chapulines (grasshoppers), mole (complex chilli sauce), and a drink of tejate (a drink made from corn, cacao beans, and rosita flowers). But I found it too hot to be snacking on fried food with hot chili sauce. So we ended up ordering some other type of refreshments (fresh coconut water). After spending a few hours at the beach and swimming in the turquoise blue water of Playa Santa Cruz, we boarded a bus for the land tour of Huatulco According to our tour guide Huatulco is comprised of nine bays and small coves stretching along jagged coastline and more than 35 white sandy beaches. Wow more than 35 beaches! He would tell us the number and the name of beaches that could be found in each Bay or Bahia. But we would only visit (more like a scenic drive to) the more developed areas: Bahia de Santa Cruz (which we already sort of explored on foot), Bahía Tangolunda. Bahía Conejos, and Bahia Chahue. From Bahia de Santa Cruz we travelled to the picturesque Tangolunda (amazing color of the white sand beach contrasting with the cobalt blue and emerald green water). Our bus drove along tree-lined highway, passing the biggest golf course, luxury resort like Barcelo, Dream Resort and Spa and luxury villas and condos, In Bahía Chahué , we found a marina with large and small yachts and lesser known beaches. There was nothing much to see in Bahia Conejos except for residential and vacation homes. On our way back to Bahia Santa Cruz, we stopped at the town of Crucesita where we visited a historical church and the town plaza. We went back to the Santa Cruz marina to board a catamaran for a scenic cruise to Tangolunda Bay. We saw the area’s natural beauty and surrounding resorts as we cruised along the blue sea. We passed some secluded beaches and saw the impressive blowhole. It was said that this blowhole is one of the top 3 blowholes found in South America. I could not get my camera ready to catch the spurt, but got another chance to capture it on our way back. And about a few clicks later, I finally got one. 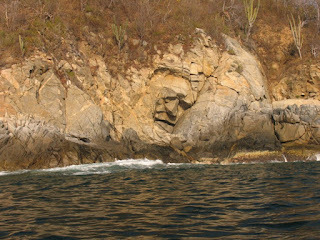 We saw what appeared to be a carved face and interesting rock formations in Organo Bay, Maguey Bay and Chahue Bay. This wonderful coastal haven belongs to a National Park, a protected area, according to our guide. For me, seeing this natural beauty was the highlight of this trip. 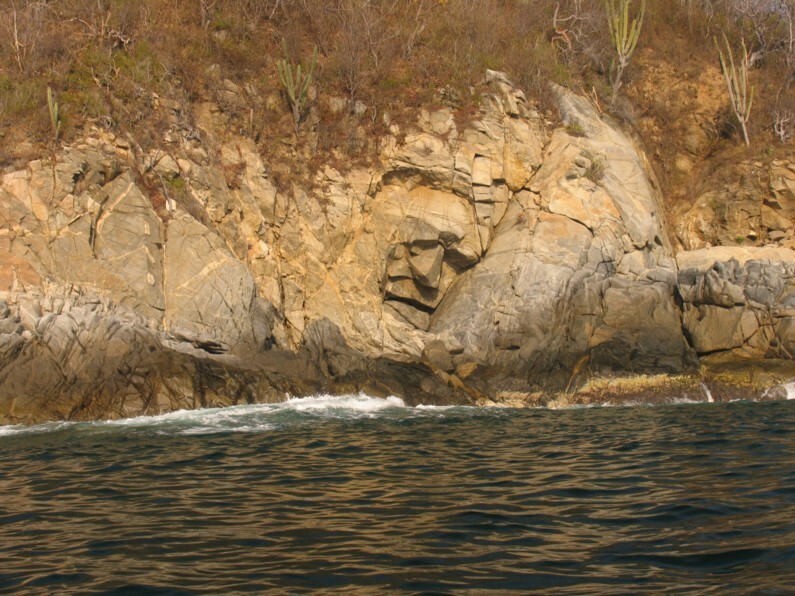 We learned that a large portion of Huatulco’s resort area is located within an “ecological zone” and that much of the area is protected from future development, and that no waste goes into its pristine water. Huatulco’s effort in preserving the environment really wowed me.